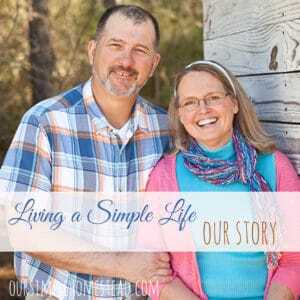 What drove us to living a simple life. Have you ever had the feeling that the world was closing in on you, that you wanted to run and hide and find a place where you could be alone? Well, that was us six years ago and is what drove us to living a simple life. At that time, my husband and I ran a successful web hosting and design company. We loved our customers, but we were on call 24 hours a day. The rat race of keeping up with the latest technology, along with living in the city was so far from our upbringing that the culture shock finally got the better of us. 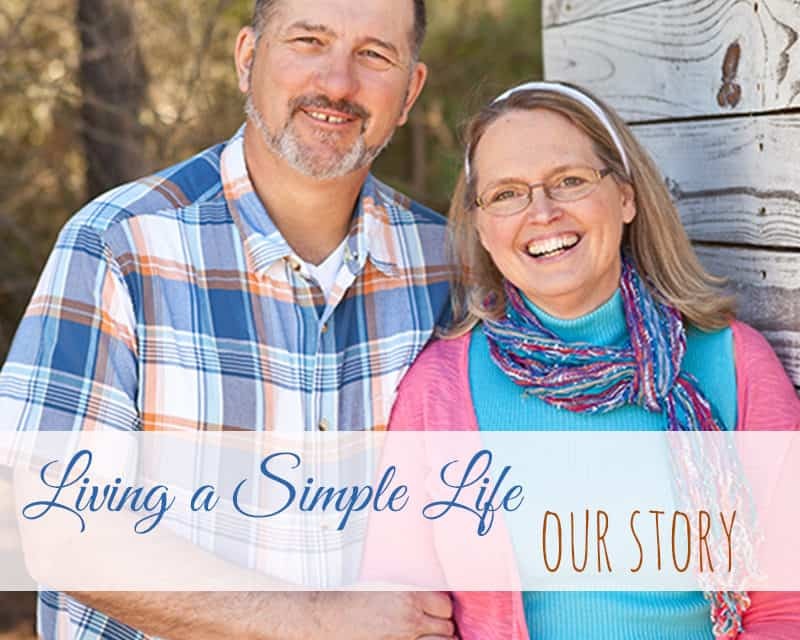 It was a hard decision to sell our business, our home and give up our security, but in the end, we knew we had to make a drastic change toward living a simple life quickly. We lost some friends; upset many of our clients, shocked our family, and it took us a year to make any sense of what we wanted to do next. We took a year off and planned the changes we were going to make. We knew that if we didn’t change the path we were on, one of us was going to an early grave. I had terrible stomach problems from the stress, and it took a year for Craig to key down from being on call for ten years. During our year off we made plans, lists, goals and talked about every scenario possible. We dug deep into what made us happy and wrote them down and read them often. 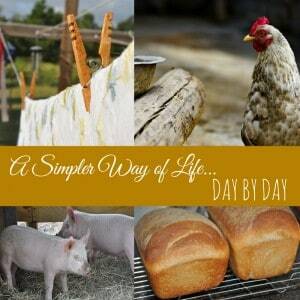 For me living in the country and being a homemaker was all I dreamed of. For Craig, it was being able to walk out his back door to go hunting and to go back to what he loved and knew best…drilling. In the very beginning, we looked at the biggest picture and then tried to figure out how we were going to achieve our goals one step at a time. Our list is still one in progress, but we get to cross new things off every year and that is such an accomplishment. Will it take us our lifetime or at least another five to ten years to complete? Probably, because we are doing it one-pay check at a time and only tackling one goal at a time. Here is what our list looks like. We work backward, so the top of the list is what we are aiming for and just for the record we are just starting our fifth year of working on this list. 10. Live on one income. Our lives have changed in the last seven years! I am no longer a basket case, and Craig loves going to work. We may not have a lot of money in the bank, we don’t drive brand new cars and we don’t live in a big fancy house, but what we do have is a newly found love for the sound of a rooster crowing, a pig splattering mud on our face, seeing the stars stretch out across the sky and the smell of freshly turned dirt. If you are dreaming of a life somewhere other than where you are, make a list and work backward by taking one small step at a time. As with everything in life…life changes and we must change with it. In the summer of 2017, we put our homestead up for sale so we could write a new chapter in our lives. 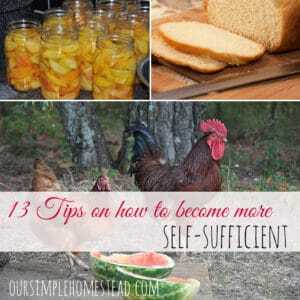 It doesn’t mean our homesteading life is over it only means we get to take our simple living philosophy on the road with us while we take a break from homesteading and travel the country in our RV. 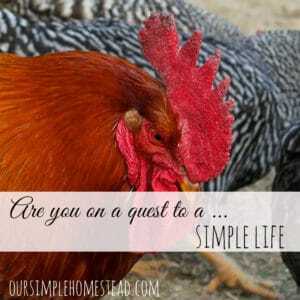 We invite you to follow us as we take simple living to a whole new level with Our Simple Homestead …on the road. A dream is only a wish until you write it down, and then it becomes a goal. Y’all are making good progress on achieving your goal. Keep it up! We’re chipping away at ours too. It’s a good feeling! It sure is a good feeling and I am happy you are making progress as well! What part of the county do you live in? Thank you for taking time to comment on our story. We live in South Carolina. Daisy it has been a life changing event but we are so glad we made the change when we did! Good luck on your goals and moving! Your story is so inspiring! Best wishes! Stopping by from the wonderful Wednesday blog hop! We have been blessed to be able to take this journey together and I cannot imagine doing without my husband! thank you for sharing your story, we will also be chucking everything in and finding a simpler life, it all starts with an idea and that first step. I totally agree! Money does not buy happiness and we are living proof. We live out in the middle of no where with no concrete for miles and we love it. When we lived in the city we lived under the airport fly zone so it was nothing to hear the roar of the airplanes engines as they prepared to land multiple times during the day and night. Now all we hear is the rooster and an occasional wild coyote, which are both sweet music to our ears. I know when we first started we thought it might take us 10 years but things are coming together faster and it has been wonderful. My husband drives a 12 year old truck and my car is eight years old, but they are in our budget and suit us just fine. I loved reading your story! Good for you and your husband! It sounds like you are well on your way there! We have a similar dream and are working on achieving it one step at a time! i love seeing how far along you are. Thanks for sharing on Natural Living Monday! Thank you so much for thinking of your new friends and re-sharing your “getting started” story! What an inspiration you are. I just got back from an out of town trip, did laundry, bought groceries, re-packed all the same bags as well as our cooler and we’re headed out to our farm to catch up on neglected chores. My city neighbors think we’re crazy – packing up and going to work after just getting off “real” work! But you know our secret – the moments out in the country building a dream are far more worthwhile than the so-called easy city life. While I’m staying in our camper and indulging in “mowing therapy” on the field and roads and dreaming of our future dream farm cottage I’ll remember your list with all its red “achieved” items and draw strength from your and your husband’s courage and determination! That is too funny! I call my lawn mowing…”mowing therapy” as well. I won’t let anyone mow but me since it is my favorite outside job. Enjoy your weekend and dream big dreams and write them all down so you can remember them often. Nancy thank you so much for the feature I will be sure to visit your HomeAcre Hop! I found your website tonight through Schneiderpeeps. What a treat to know that you live in SC. I live in Columbia. Enjoying your fabulous Friday posts. Well hello Susan! We live in Batesburg so we are neighbors. Batesburg?!?!? I live in Saluda!!! Small world! WOW! What a small world …We live closer to Saluda than I do to Columbia! How far from the traffic circle are you? 9 miles from the circle. on 378. We love going to Batesburg for Shealy’s. 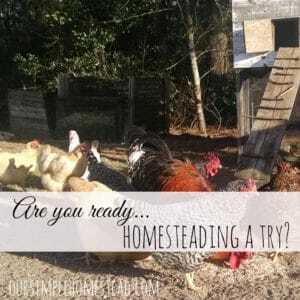 I have been looking for fellow homesteaders around us. the only other person i have found really, is in Anderson. I’m excited I have found some one so close! We are within 30 minutes of one another! You are just down the road from me – literally! I’m in Modoc – a tiny little town just west of Edgefield, an hour west on hwy 23 from you. 🙂 Thanks for sharing your story – it sounds a whole lot like my own, with a very similar goal list. We just moved here last August, so I’m not nearly as far down my list as you are – but I’m very excited for my first big garden this year, and adding chickens to the farm. I giggled when I read your husbands dream – my husband was the same – just wanted to be able to walk out back and hunt. How exciting…I have met many SC people through my blog. One of my dearest friends is One Ash Farms in Ridge Springs and I met them here. WE buy our raw milk from them. Have you heard of them? I have heard of them! I subscribe to their newsletter. 🙂 I just love the farming community in this area!! We live near Columbia and are also having the worst time with fruit trees. Lost all but 2 peach trees to bad fungal infection… Orchards are a labor of love… And sweat… And tears… Not to mention a few curses at times! Wish you luck! We have struggled with out fruit trees as well and you are right it is a labor of love! Hi Tracy, I love the look and feel of your website. Your story is inspiring and I encourage you to keep on keeping on. My husband grew up on his family farm and I came from the city. We lived on the farm after we were married with his parents but it couldn’t support us all. Eventually we sold the farm and my husband and I bought a small holding. Unfortunately we went into debt with this and after 5 years we were both working to pay the mortgage and lost our way with our family. We sold up and rented in the country for 7 years and now we live on our own small farm (60 acres) debt free. We had been praying for quite a few years for this and God has supplied all our needs. This doesn’t mean that all is finished and we enjoy working on it to get things the way we want. I look forward to reading more of your journey. Also both my husband and sons enjoy hunting. Congratulations. Terri you have a great story and how awesome to be living on 60 acres debt free! What an accomplishment! Hi Tracy, Loved your inspiring story! My husband and I are in our early 50’s and are planning to homestead our 6 acre property in WA next spring. We live in western NC right now on an acre and a half and have been “practice farming” for a few years. As soon as our daughter graduates in Spring-we’re out of here!!! ( she’s coming too!) We have gathered a library of books and information, gone to seminars and classes, took on extra jobs to pay things off and are downsizing drastically! Wish we had come to our senses years ago but it’s never to late. Thank you for the inspiration! Lori it is never too late! I am in my early 50’s as well and we only started this adventure seven years ago and we felt it was now or never to follow our dreams. We are looking forward to spending our retirement years enjoying our farm and country living! 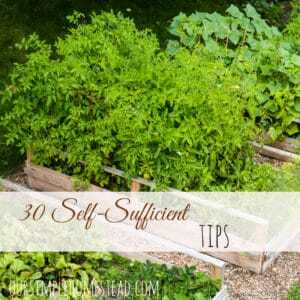 Hello Tracy, your story mimics ours, and a year in a half ago we too became sold out for self sufficiency homesteading. I can say it’s been the absolute greatest decision we have ever made in our life! As I read through your list I noticed you raise meat rabbits, we do too, and I’m always looking for “new” to me recipes, do you have any that you would like to share? We as well raise chickens and beef, we are organic people so our beef cows are lowline black angus, all grass fed, when your ready for cattle I highly recommend you researching this breed there are many benefits that I have enjoyed with raising them on our homestead. Michelle thanks so much for the tips on the beef cows. We are actually shopping right now for the best breed to raise. We have raised some jersey calves, but want to try to raise a faster growing breed. Thanks again! I love this. My dream of getting back to country living just started to turn into a goal that can be realized a few months ago. I love your list and have many of the same things on the list in my head. I will write it down this weekend. Our list is always changing but this one is the one I always go back to. Thanks for visiting. I’ve been following you for some time now. And, of course, loving everything you so sweetly share with us. I love your story. It’s also wonderful and inspiring to see how far you have come and grown from your new way of life. I didn’t realize you raised meat rabbits. I want to do the same. Do you have any posts regarding your rabbits, what breed you have, how many, and any suggestions or advice regarding raising meat rabbits? Bobbie I need to write a post on our meat rabbits. I am having a hard time getting a good picture of them. They got out of their pen a few months ago and live under the barn now. It’s a funny story on how they became free ranged rabbits and I need to tell it. Love your life story! Last year my husband and I was able to buy a 23 acres farm and an old farm house that was built in 1900. I have love redoing the house. I so understand about the job. 16 months ago my husband left his job this past week he started a new one. After a year of waiting on Gods door to open It has.. We live a simple life now. I grow a large garden. we have 16 chickens. About a dozen eggs a day. and 3 pigs.. which I never thought I would get my city boy husband on a farm! We have lean this past year to live on less than half our income. BUT the like of stress from our last jobs is so worth it! we love our little farm and simple life now! Praying and waiting on what God has next for my family!!!!! I love your story as well! We have had to cut back on many things to live this life style but it is so worth it! Your blog is inspiring! We’ve recently purchased several acres in New Mexico, and we want to become as self sufficient as possible too. Thanks for all the great resources and experiences you’ve written about. I can’t wait to see where your RV journey takes you. Oh I love this! I’m brand new to your site and what an amazing journey to read about. I’m about to go explore your article about where you are at now.